Anaesthesia is the division of medicine that involves pain relief and loss of sensation or feeling. It is commonly used for many forms of pain relief and also during surgical operations. There are different types of anaesthesia which include general, spinal and epidural anaesthetics.Depending on your reason for requiring an anaesthetic and your normal health status will help the anaesthetist decide which type of anaesthetic is going to be the best selection. Spinal anaesthesia is slightly different to epidural anaesthesia as the drugs are injected into a different space. During a spinal, pain killers and other substances are injected directly into the cerebro-spinal fluid of the spinal cord. When performed correctly, a spinal can be an excellent and very safe way of receiving anaesthesia and is frequently used for surgical operations. When is a Spinal Given? Spinal anaesthesia is used when the patient is going to have surgery on the lower half of the body.There are many benefits to having a spinal as the need for any medicines that affect the respiratory system can be avoided. Often the thought of having an injection into the spinal area is worse for the patient than the actual procedure itself and many find that they were overly-worried about it than needed. After having a spinal anaesthetic, the patient can remain awake during the operation and have very few ill-effects afterwards which usually means they recover a lot more quickly and can be discharged earlier. The drugs used for spinal anaesthesia are also a lot less expensive that those used for a general. The aim of an epidural is to cause the lower half of the body to lose enough sensation to block out any pain.The actual procedure involves injection a mixture of drugs into the epidural space which lies just around the spinal cord. The mixture is injected and spreads to the lower half of the nervous system where it works by blocking pain signals. Although pain is not normally felt with an epidural many patients will continue to feel touch or pressure but this is not normally problematic in any way. When is an Epidural Given? An epidural is very commonly given during labour. It helps the patient manage their pain but allows the natural processes of childbirth to continue. Although it may slow down the labour a little, it can help make the concept of birth more manageable and less traumatic. Modern forms of epidural used for childbirth mean that the patient can have their pain severely reduced whilst still maintaining the ability of movement. This has proven to be very beneficial for women during the labour stage of pregnancy. Another added bonus is when and if the lady is found to be requiring a caesarean section as the epidural can normally be topped up which prevents any further anaesthesia being needed during the operation. 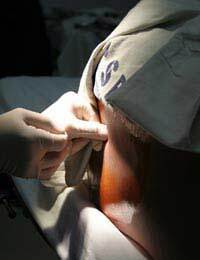 Epidural anaesthesia can also be used to some degree for surgical operations in the first instances (obviously providing the surgery required involves the lower half of the body) and quite commonly as a form of pain relief after the operation. A patient may be administered an epidural before they have a general anaesthetic which allows them to be given strong pain relief after the procedure. This is used when major surgery is performed not for minor procedures.Not everyone will be a suitable candidate for receiving an epidural and your GP or anaesthetist will discuss your suitability with you. Anaesthesia is a very important part of medicine and training as an anaesthetist is highly specialised. Most patients having surgical procedures or during labour will require some degree of pain relief and medicines and it is important to explore which of the many options is most suitable for your own individual needs. Always make sure that you give your anaesthetist your full medical history and make sure he or she knows exactly what medications you currently take as this may contribute to which form of pain relief you are offered.